New Picture eBook! On Amazon and Kobo! Download the eBook & read along with the song! A fun and adventurous day can make us messy and unrecognizable! Fortunately, bathtime is there to clean us up. “Prelude To A Bath”, a song from Marcie’s children’s album, is brought to life with colorful illustrations by Pabón. Grab a FREE download of the song the book is based on here! Don’t forget the follow up song, CLEAN CLOTHES. Categories: FREE Downloads, News, Video & ebooks | Tags: amazon, babies, bath, bathtime, clean clothes, ebook, family, free, free kids' music, free music, fun, hygeine, kobo, mess, outside, playing, rubber ducky, story, toddlers | Permalink. in Brookline, Boston, Cambridge & Arlington! Class Titles: Sensory Play, Art with Movement and Music, Musical Playtime, Play and Pretend, Adaptive Zumba for Special Needs, Theater Exploration and Movement, Afterschool Enrichment. BAC has been awarded Boston magazine’s Best of Boston ® 2015 – Best Kids’ Art Lessons! Boston Magazine has listed H2K as a Gym-Class Hero! Hill House Has been serving the community for 50 years! Categories: Activities, News | Tags: afterschool, art, boston, brookline, cambridge, classes, drama, enrichment, family, h2k, hill house, infants, kids, movement, music, play, sensory, theater, toddlers, zumba | Permalink. 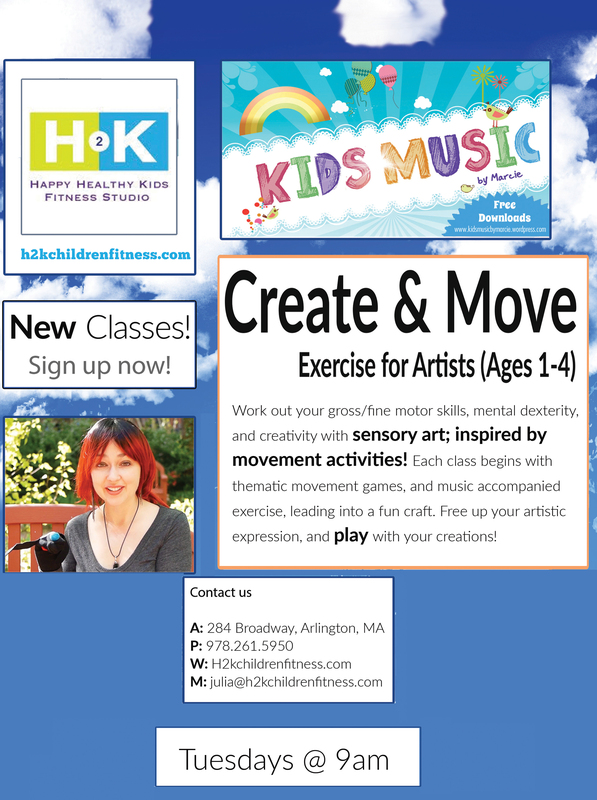 Summer Newsletter- Parties, Playgroups, & Classes! Hello! I hope you are having a great summer. 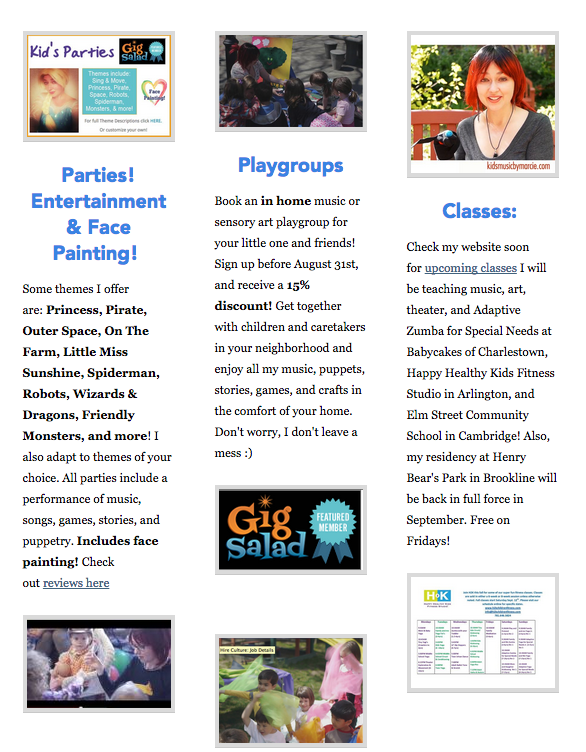 I’m working hard implementing Arts In The Park programming in Cambridge, teaching Musical Theater/Drama classes at Summer Scene in Framingham and Messy Munchkins Art in Charlestown, and performing all over at festivals, birthday parties, camps, and daycares. If I haven’t seen you yet this summer, I hope I’ll catch you at an upcoming class or show! Read More…. Categories: Activities, News, Performances & Donations | Tags: arlington, arts, boston, children, classes, crafts, family, framingham, infants, kids, marcie, park, performance, summer, toddlers | Permalink. 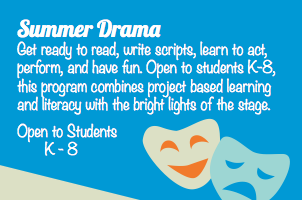 Class Descriptions- Register Now For SUMMER 2015! 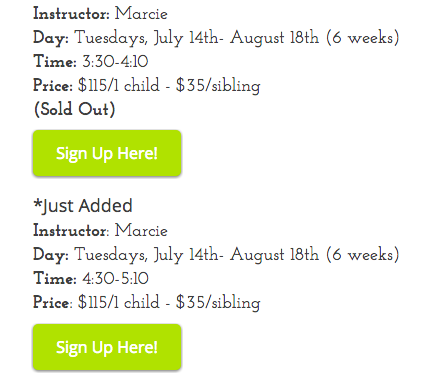 Join Marcie as she teaches summer Drama & Musical Theater classes at Summer Scene! This class is all about the mess! We will explore your child’s introduction to creativity with sand, water, play dough and more! We will paint with textured objects and other different, unconventional, non-toxic materials. Your little one will also participate in circle time at the beginning and end of class. Messy Munchkins is all about being creative and making a big mess that YOU don’t have to clean up. 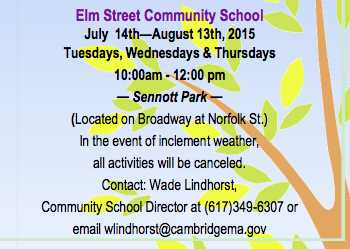 Cambridge Arts In The Park– Sponsored by The City of Cambridge. 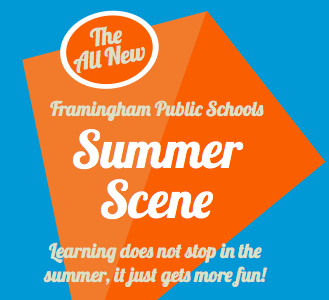 Categories: News | Tags: activities, arts in the park, babycakes, cambridge, camp, crafts, drama, families, family, framingham, free, kids, musical theater, students, summer, theater | Permalink. Kid’s Music By Marcie will be at The Roslindale Village Main Street Farmers’ Market this Saturday, June 20, 2015. The Roslindale Village Main Street Farmers’ Market takes place rain or shine every Saturday from 9 am – 1:30 pm, featuring weekly live music and children’s entertainment. All children’s entertainment starts @ 10am, and all live music will start at 11am. Categories: News, Performances & Donations | Tags: adams park, children's entertainment, community, family, farmer's market, free, infants, kids, marcie, organic, roslindale, roslindale village, toddlers | Permalink. 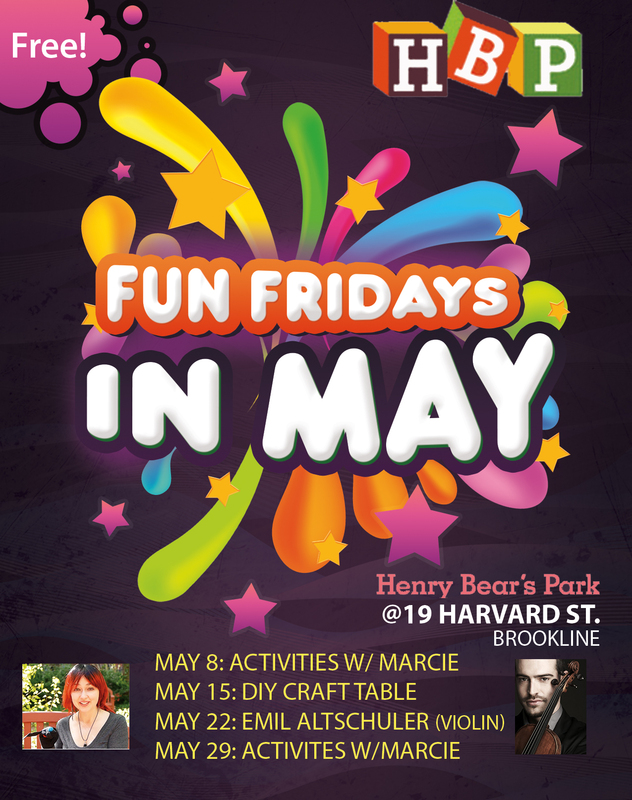 Henry Bear’s Park & Kids Music By Marcie present Fun Fridays in Brookline! Every Friday in April features interactive activities for families @ 5pm. Relax in Henry Bear’s inspiring space with Stories, Crafts, Songs and Games in Brookline Village! Categories: Activities, News, Performances & Donations | Tags: activity, brookline, craft, family, free, fridays, fun, henry bear, kids, singalong, toddlers, toys | Permalink. New Spring Class! Create & Move! Work out your gross/fine motor skills, mental dexterity, and creativity with sensory art; inspired by movement activities! Each class begins with thematic movement games, and music accompanied exercise, leading into a fun craft. Free up your artistic expression, and play with your creations! Tuesdays @ 9am at H2K Happy Healthy Kids Fitness Studio! Categories: Activities, News | Tags: activities, arlington, art, children, class, craft, create, creativity, exercise, family, fine motor, fitness, gross motor, happy healthy kids, kids, ma, marcie, movement, music, play, sensory, toddlers | Permalink.